Sometimes a day calls for an outfit that I don't want to think about putting together. On those days I need a cute sweater (in the winter), jeans, boots and a bag. And if my hair has a mind of its own that day, then I need a hat. This was one of those days. Though I appreciate when pieces have additional elements and details so that my outfit isn't completely a snoozefest. 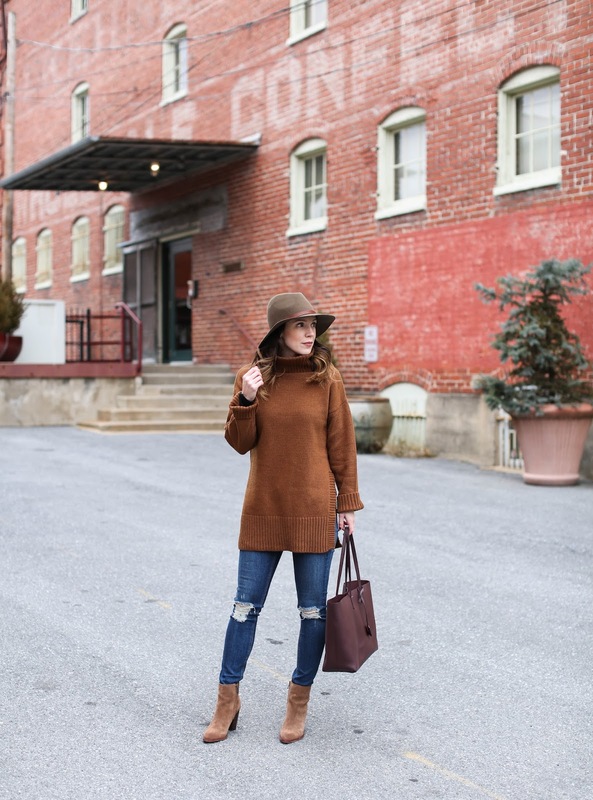 Like the slits in the side of the sweater, the distressing in my jeans and a hat always helps to break up the monotony of a look. I find that adding a hat always makes an outfit go from boring to head-turning. I'm a bit hesitant sometimes with large brimmed hats that they will look too head-turning, but Rag & Bone strikes the perfect balance with their hats. Janessa Leone is another designer that I turn to for fall/winter hats, though hers a bit more bold so I often will try 4-5 different styles before settling on one I like. 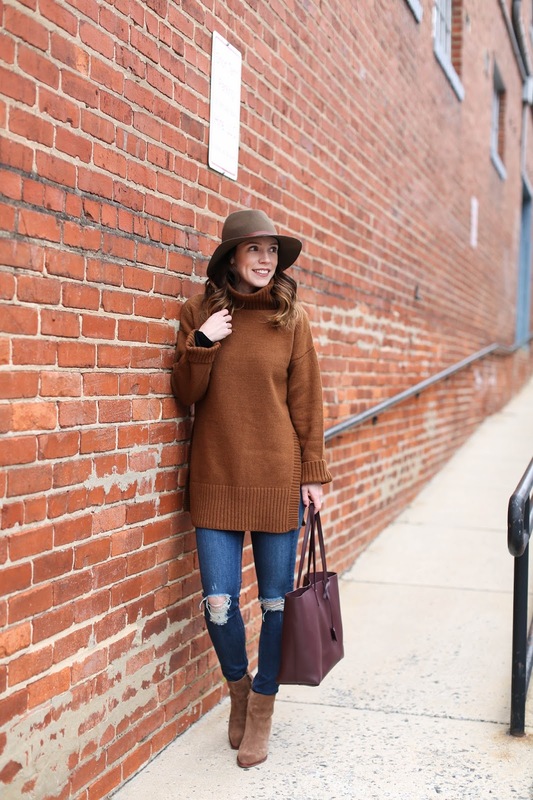 To slightly veer off the fashion talk for a bit - I wanted to give an update on how I am adjusting to life outside of NYC. Full disclosure, I had a few questions from readers asking me to talk about this specific topic on the blog or in a video so I thought I would touch on it a bit in today's post. If you don't know, Stan and I moved out of NYC 10 months ago after both spending many (many, many) years there. I lived in New York for 15 years and Stan was born and raised there. We moved to an area about 40 minutes north of D.C. where we built a home with my mom. In the months leading up to the move, I was so worried that I would miss NY terribly and was unsure how I would acclimate to life outside such a bustling city. The truth is - I hardly even think about it most days if ever. In fact, I didn't have much time to think about it over the past year which might have been the best thing. We moved shortly after my second spine surgery from which I was still recovering, embarked on a 4 week long road trip through the southeast, were faced with the devastating news that my father had stage 4 pancreatic cancer, helped my mother care for him daily for the two months he was ill, and then moved into our new home 2 weeks after he passed away. Whew, I'm exhausted just typing that. But while it was a whirlwind at the time, I never had much time to dwell on the fact that my surroundings were vastly different from what I had come to know and love. There are days that I miss certain things or places I used to frequent in NYC, but I rarely harp on that feeling because it truly serves no purpose for me. I am someone that always keeps moving forward. Reminiscing or reliving fun memories is one thing, but missing, pining for or fixating on the past only serves to keep me from fully accepting my present life and enjoying it. That being said, living in NYC for almost half of my life definitely left an impression on me, and those imprints are still part of me to this day. I love to find local stores, cafes, businesses that have unique character and charm. I appreciate diversity, seek out culture wherever I can and still dress like I'm strutting my way down 5th avenue. Those things are who I am no matter where I live. 2. Don't dwell in those feelings because in the end, they will not serve you. As the saying goes - don't look backwards, you aren't going that way. 3. Find the closest large or major city that you can drive to, and go there once or twice in the beginning. It helped me to feel a bit like I was back home and it gave me such an adrenaline rush to be back in a fast paced environment. It's like I was weaning myself off the hustle and bustle. Ha! 4. Get out and find every locally owned coffee shop, clothing store, trinket shop, etc you can. Locally owned businesses will always have more charm than chain places and it can make you appreciate your area even more. Plus you may make some connections that help tie you further to your new community. 5. Join something. A cooking class, a local volunteer organization, a moms' group, a workout class - anything that only has people from your area as the majority of its members. Hearing from people that love where you now live is helpful in making you enjoy it more. I started going to a local workout studio 1-2 times a week and have loved it. 6. Google the places in your area that are must see spots or tourist recommendations. Even head to a visitor center if you have one, and then visit all the places they feature. You will learn the area much better, and can appreciate what makes it the place it is. 7. This next one you may laugh at, but even if I wasn't a blogger I would recommend doing it. Find all the best places in your area to take an Instagram. The whole point of Instagram is to create and share beautiful imagery, so therefore you will be forced to seek out the most photogenic and gorgeous places in your area. That could be an old covered bridge, fun graffiti wall, community garden, fancy hotel or hip, cute coffee shop. There is no better way to appreciate where you live than to see it's most beautiful places. 8. Find something that was NOT in the place you used to live, but is now in your new city, and visit often. For me that was Target. LOL There was no Target near me in NY, and I absolutely loved shopping there. So when I moved to our new place, I made a point to visit frequently as a way to appreciate what I now have that I didn't before. 9. My final suggestion is a pretty basic one - get out of the house for anything and everything (and if you work from home - do it at least once a day). The gas station, the food mart, a museum, the park, the nail salon, the dry cleaners etc - and maybe if you go enough times, they will remember you. And hey, isn't it nice to be recognized and known when you go places? After my 2nd visit to the nail salon, they knew my name already and always chat me up as soon as I come in. It made me feel like I wasn't a stranger in a new place anymore. Hope these tips are helpful. Change is never easy, but necessary and inevitable so it's always great to find a way to accept and embrace it.